Inheriting from Tigertek Springer tank, Springer S RTA is a unique and powerful rebuildable tank with 2ml/3.5ml e-juice capacity and 24mm/ 26mm diameter. With the innovative and convenient screwless coil building deck, Tigertek Springer S RTA is absolutely the good choice for build tank lovers. 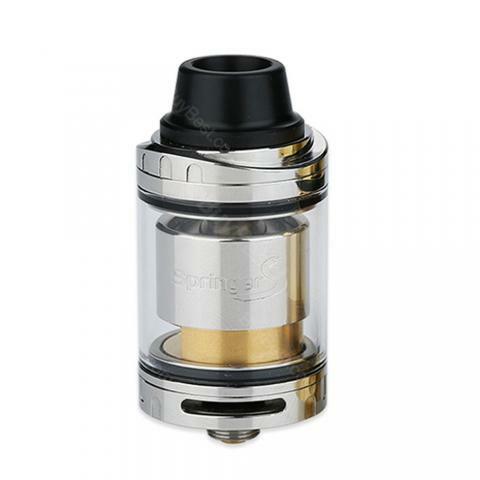 The Tigertek Springer S RTA is a updated version of Springer tank which adopts a unique screwless coil building deck and 2ml/ 3.5ml e-juice capacity. With the interchangeable springs on the deck, the coil is easy to be built and replaced. You can press the post down and install the coil quickly. Together with the convenient top refilling design and an adjustable bottom airflow control, Tigertek Springer S will bring you an incomparable vaping experience. Best choice for the vape lovers of single coil build tank. • 510 thread. Compatible with most 510 MODs/batteries. • You can select the e-juice/DIY tool/wick/coil separately. Having fun in building my own coils lately, absolutely love this Springer S.
Springer S came with a screwless coil building deck, which is extreamely convenient. Flavor and vapor production both superb. Tigertek Springer is a worth-buying rta. with this cheap price, what more can i ask.